MS offers versatile styles of Synthetic Air Filter for use in air filtration system of all types. 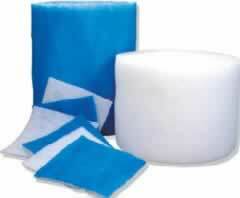 These kind of products are available in bulk rolls and pads. MS Synthetic Air Filter Media is primarily used as a pre-filter for more expensive final filters, often extending the life-cycle of these final filters by 50% or more. Other popular application include gas turbine air intake system, commercial and industrial central air handlers, unit ventilators, fan oil units, or any system where fiberglass or other filtering materials are not required.